All Kodak filters are special order items. Kodak filters are available in more than 100 varieties. Gelatin filters are for use with image-forming light beams. Minimum order quantities may apply. Orders for filters will require up to an 8-12week lead-time. 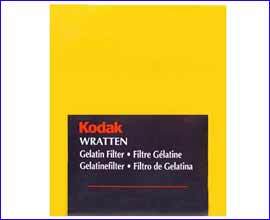 KODAK WRATTEN Gelatin Filters are separated into the 7 types listed below. Kodak Basic Color Filters are used to alter the color wave length of light. Special Dye Color Filters incorporate rare dye materials and are also used to alter the color wavelength of light. Color Conversion Filters enable significant adjustments in the color temperature of the illumination as required (e.g., daylight to artificial light). Color Conversion Filters control color by attenuating principally the red, green, or blue part of the spectrum. Can be used to make changes in the color balance of images recorded on color films, or compensate for deficiencies in the spectral quality of a light source. Light Balancing Filters enable minor adjustments in the color quality of illumination to obtain cooler (bluish) or warmer (yellowish) color rendering. Infrared Filters are used in infrared photographic applications. Neutral Density No. 96 Filters are used to reduce the intensity of light by a definite ratio, without affecting the tonal rendition of colors. Neutrality is superb only in the visible spectrum. Additional filters are available upon request and minimum order.